How Easy Is It To Replace An Existing Electric Shower? Fast Fit Showers. Replacing an electric shower can seem a bit daunting. As sometimes the water inlets or entry points may be inconsistent with the shower brand that you are replacing. Which can lead to extra work but the T80Z electric shower is designed for a hassle free installation. What Are Fast Fit Showers? The Triton Fast Fit or T80Z electric shower is the next generation of the UK’s best selling shower. They feature a high quality design, with great performance. Furthermore they are so easy to install as the unit simply covers the footprint of most electric showers. Consequently leaving no unsightly drill holes from the previous installation. Great Styling And Easy Fit! The TZ80 Fast Fit has a strong rigid back plate which will not distort on uneven tiles and also features the latest Swing-Fit TM technology and Swivel-Fit TM technology. Most of all, you are able to connect the water and electric on the left or right hand side of the unit. 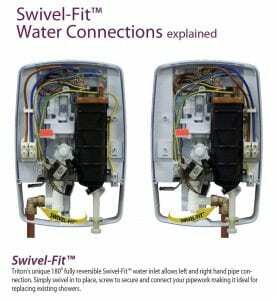 With Swivel Fit Technology Triton T80Z Is An Easy Install. Models Available – 7.5kw, 8.5kw, 9.5kw & 10.5kw – Please note that if selecting the 10.5kW rating for this model, you will require 10mm2 cabling. Please check existing cabling for compatibility. The Triton T80Z – Has Multiple Entry Points. First and foremost disconnect the power supply to the shower. Check the electrical supply is in good condition, basic knowledge of electrics is of course necessary, but if in any doubt call out an electrician. Once checked, switch off the electrical supply and the water. The next step is to remove the existing shower, a simple job. As the T80Z has multiple entry points you should be able to place it and connect it straight in! Have You Recently Installed One Of These? How Easy Was It?! Leave us a comment below, or for more information visit Triton Showers. If you have found this post helpful please feel to share on Twitter or Facebook and look out for others from SNH! Posted in Blog and tagged Do I Need An Electrician To Fit An Electric Shower?, Electric Showers, How Easy Is It To Change An Electric Shower, How To Fit A Triton T80Z Shower, What Is A Retro Fit Electric Shower?